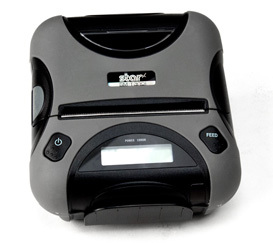 The Star Micronics SM-T300i mobile printer gives you the freedom to print receipts virtually anywhere. Lightweight and easy to configure, the SM-T300i is an ideal choice for line busting, mobile POS, or mobile invoicing applications. The SM-T300i prints standard, 3" wide receipts, the same size you see from stationary receipt printers. Receipts are printed at 3" per second, fast enough for most mobile POS applications while not draining the battery too quickly. The rechargeable battery in the SM- T300i provides 11 hours of reliable printing, ensuring employees can work a full shift without having to recharge. Bluetooth provides communication between the SM-T300i and your Bluetooth-enabled mobile computer, laptop, or smartphone, giving you easy setup without bulky cables getting in the way. Shipping with a 1-year warranty standard, the Star Micronics SM-T300i mobile printer is a great addition to any mobile POS setup. • Dimension (WxDxH): 4.7" x 5.14" x 2.3"